The cute vertical lines of this design remind me of glasses stacked one on top of the other, just waiting to be filled with champagne or a cocktail at a posh Hollywood bash. I’ll have mine with Ice And A Slice please. 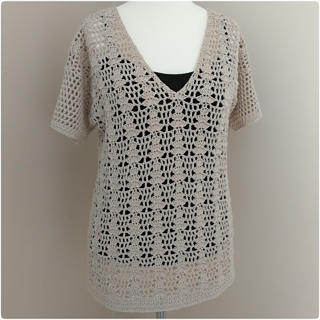 This pattern uses simple stitches to make a fabulously lacy top. Use cotton or a cotton blend for the warmer seasons or try it in merino or wool for cooler days, wear it as the perfect layering piece. 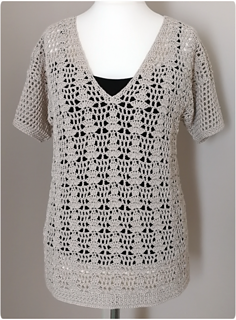 Pattern Note: extra length may be added to the body of the top at the point indicated in the pattern. Or for a cropped version, work less pattern repeat. Select size based on the finished chest measurement that best suits your requirement. The pattern is designed to have positive ease.